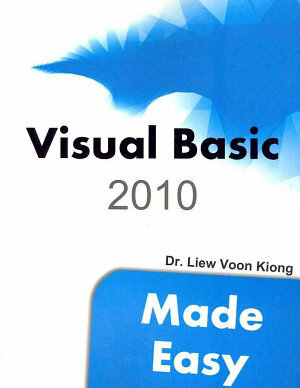 The Controls in Visual Basic 2010 are objects that can be placed on the form to perform various tasks. To view the controls in VB2010, click on the Toolbox tab to bring up the common controls Toolbox as shown in Figure 2.1. The controls are categorized into Common Controls, Containers, Menus, Toolbars, Data, Components, Printings and Dialogs. At the moment, we will focus on the common controls. Some of the most used common controls are Button, Label, ComboBox, ListBox, PictureBox, TextBox etc. To insert a control into your form, you just need to drag the control and drop it onto the form. You can reposition and resize it as you like. Lets examine a few programs that made use of Button, Label, TextBox , ListBox and PictureBox . You don't have to worry so much about the code because I will explain the program syntax as you progress to laterlessons. When you run the program and enter two numbers, pressing the calculate button can let the progam performs addition of the two numbers, as shown in Figure 2.5.